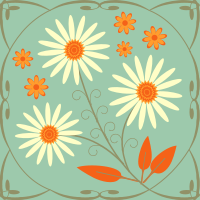 some of the changes in cross stitch designs that this pattern highlights. There are so many more colors of DMC floss now, not to mention all the overdyed flosses and silks and rayons –oh my! The color palette of this pattern is extremely limited, even for its time. For example, follow the use of that obnoxious orange used for the wagon wheel in “Santa with bag of toys on back” and again for the doll’s hair in “Santa with Christmas tree over shoulder.” This orange was also supposed to be used for the hobby horse head in “Santa with bag of toys open as if to offer toys to little children” but I couldn’t stand it so I frogged it and changed it to a rusty brown before I’d “allow” my roommate to sew the lining and fringe on. Nowadays, most designers, I believe, would go ahead and call for three different colors for these three objects, and none of them would be that obnoxious orange. juxtaposition of the colors, including shading, is so much more crude than it probably would be today. In my own growth as a stitcher, I realize that nowadays I would have known right-away that I was never going to sew all of the skirt fringe and the backing together. If I bought this pattern today, I would go ahead and buy the pre-made Tilla Christmas Tree Skirt. I think it was $40 fifteen years ago, which seemed at the time to be an exhorbitant amount for someone on a grad student’s salary. Nowadays, I would buy the pre-made tree skirt and wouldn’t even think twice. I can’t tell if that’s progress or not. You tell me. Previous Post Heirloom Tree Skirt Finished! Kate, I LOVE this pattern, and have been hunting for it so I too can make the Christmas tree skirt that I have always wanted. But i cannot find the pattern… is there anyway i can buy the pattern from you, or borrow it awhile so i can use it? I have the skirt and have loved the pattern on the outside of the package…and always thot the directions/pattern would be on the inside, but I have been so disappointed! Thanks for visiting my blog, and sorry for taking so long to get back to you. I haven’t been keeping up with this blog as well as I would like, but I’m working on getting back to it. This is a great pattern and if you don’t mind it being kind of “beaten up,” it’s yours! I’d love to pass it along to someone who will actually make it. Send your address to “thelyfsoshort@att.net” and I’ll put it in the mail. I made 2 of these tree skirts and a Grand daughter wants me to make one for her. 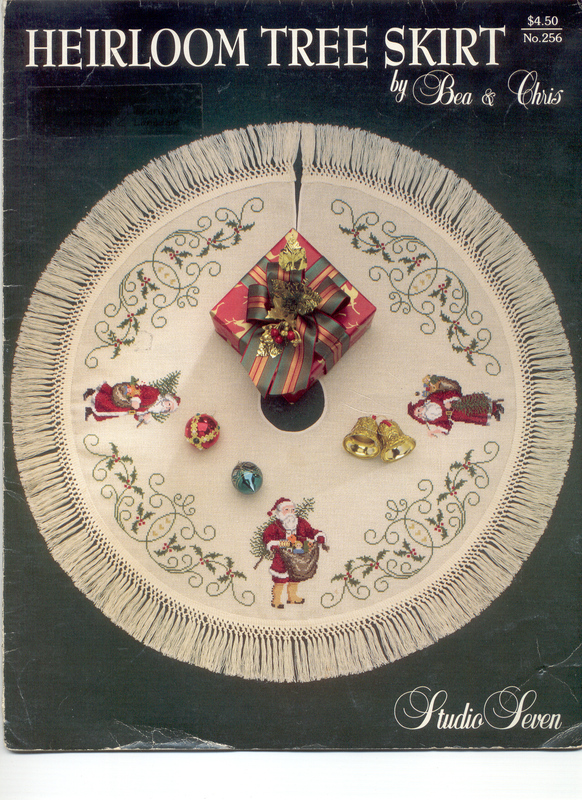 I have the pattern, but can’t find the tree skirt. Sorry it’s taken me so long to get back to you, Theresa! I had a very talented friend of mine sew me the tree skirt after I stitched the design on 11-count Aida. I did a Google search and this is what I came up with: http://www.needleworkersdelight.com/MiscellaneousPrefinishedItems.html (scroll down to the middle of the page). It’s called a Tilla Christmas Tree Skirt by Zweigart; it’s 43″ in circumference. Hope this helps! Let me know how the project turns out.